Whoa this has been a crazy start to June. I started a new clinical rotation last week which I LOVE, but it has made my commute extremely long which is throwing off my schedule. And I’m a girl that likes her routines, to say the least. What’s even more exciting is that we finally moved! I loved my old house, but it’s nice to have a change. We were moving all day on Friday, we rented a U-Haul and did the whole shebang. My Body Pump muscles certainly came in handy carrying beds and dressers and desks, but apparently I bruise like a peach because I am COVERED. Seriously, I look like I’ve been abused. I was wearing long shorts (perks of being a former golf team member) all weekend so that people in Target wouldn’t report the GS to the authorities. I almost took a photo to show you, and then realized that 1) There is no way to take a flattering photo of your upper thighs and 2) No one wants to see a photo of my upper thighs, whether it’s flattering or not. So use your imagination. 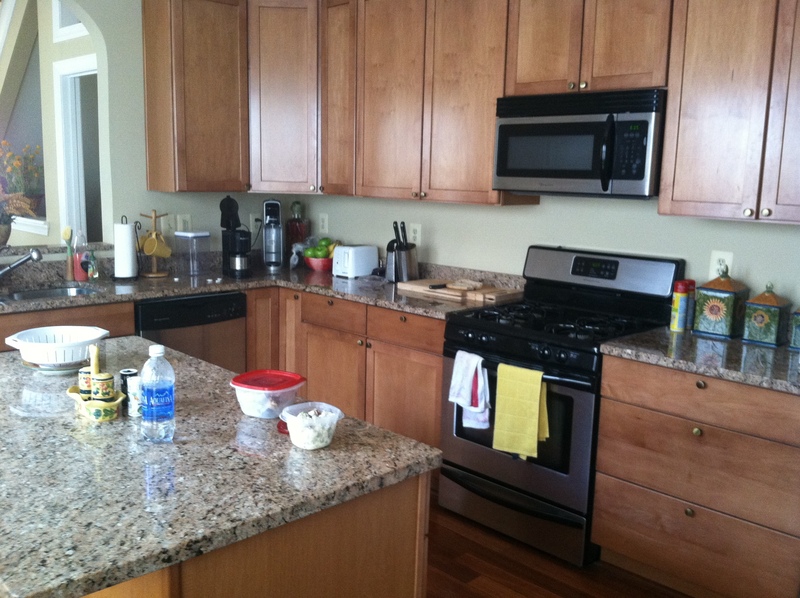 It’s also been fun to organize and arrange my room and the kitchen. I alphabetized my spices as I unpacked them on Saturday. No joke. 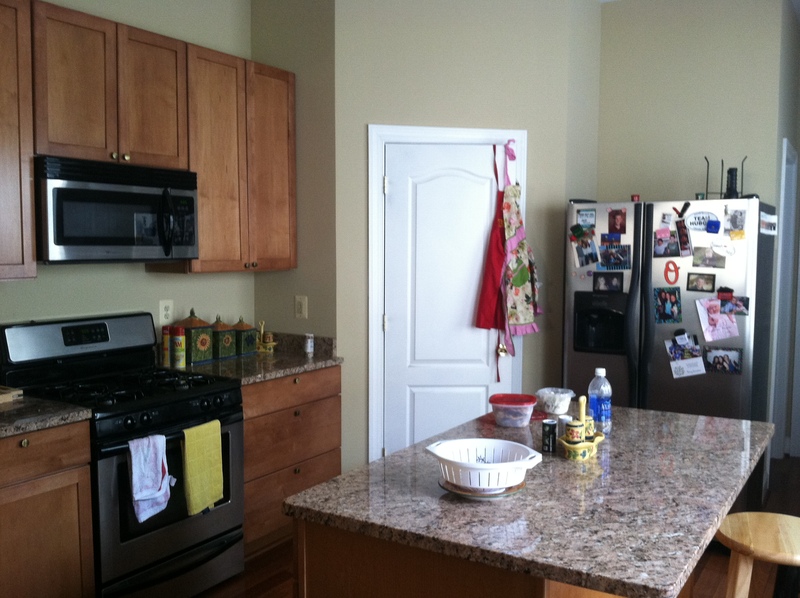 I was so excited to start cooking in my new kitchen because it’s beautiful and has so much storage. See?!! Somehow, the first meal I made was grilled cheese sandwiches and corn on the cob. Not that chicken salad is much fancier, but this recipe is definitely worth passing on. I happen to be somewhat snobby about my chicken salad- can’t be dry, but can’t be slathered in mayo (ahem, Ina Garten). This is meant to imitate Willow Tree chicken salad, which is a New England thing and requested by my Rhode Island Gentleman Suitor. It also somewhat reminds me of Panera’s chicken salad, which I had the other day and quite enjoyed with the exception of my mild panic attack when I thought a grape was an olive. Cook your chicken. I boiled mine, but you can also bake it or buy rotisserie chicken. Chop or shred your chicken. Chop the grapes, celery, and onion. You could also add apples or raisins or whatever suits your fancy. This is a chicken salad on the sweeter side (the brown sugar is the secret ingredient), so go with it. Mix with the mayo, brown sugar, salt and pepper until just combined. Allow to chill in the refrigerator for at least an hour. Assemble your sandwich. 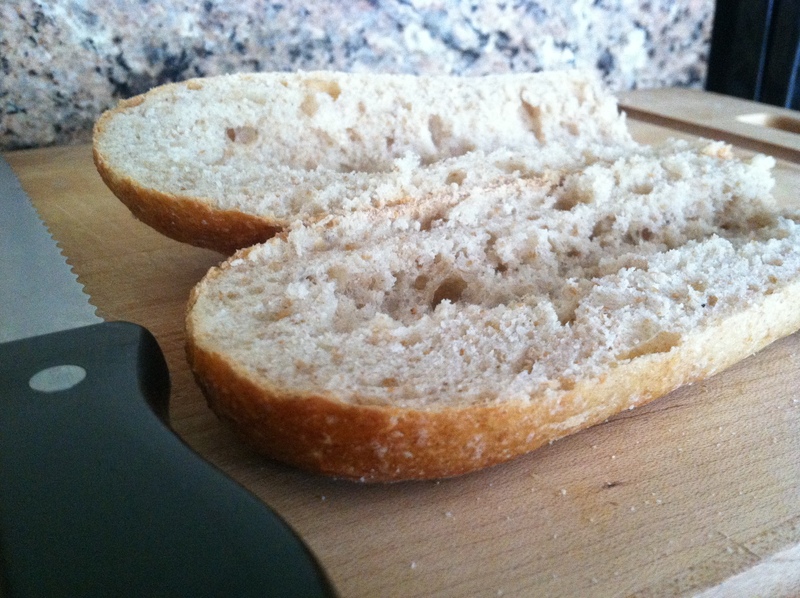 Whole wheat baguettes were BOGO at Harris Teeter and fresh from the oven- sold. 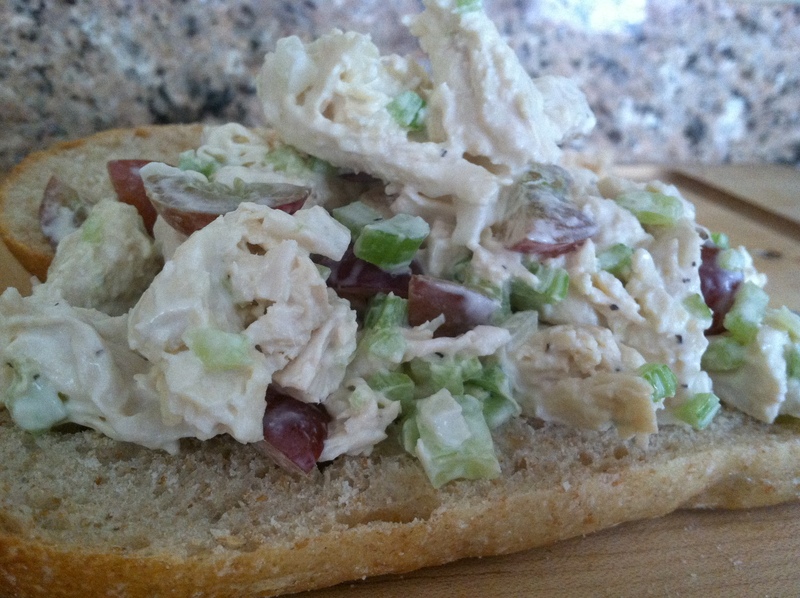 I scooped the bread, not to save calories (I eat the innards, obviously) but so that I can fit more chicken salad –> smart. I promise to use my temperature-accurate oven or my new roommate Meagan’s crockpot to whip up something fancier for you soon. But in the mean time, get your sandwich on.